When I look at the JBC rework station RMSE, I see no tweezers in it. Can I connect them to it? When you purchase a JBC RMSE rework station you will not get them though. You will have to purchase them separately and don’t forget the stand for them! 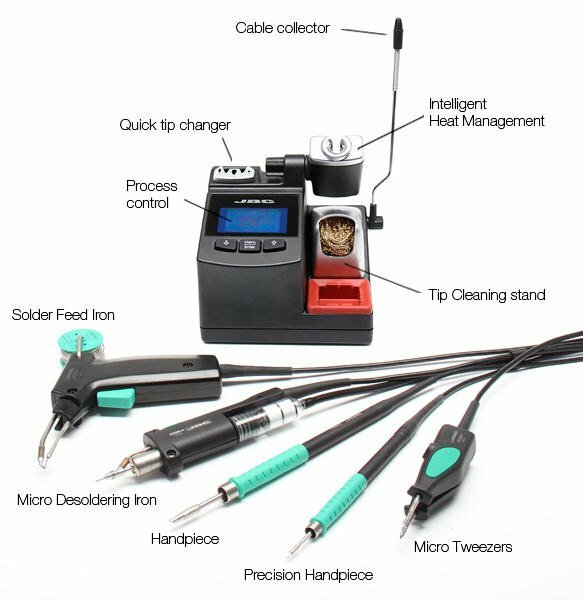 Are there any easy steps to desoldering using JBC hot air equipment? What’s a good repair process for QFP’s? 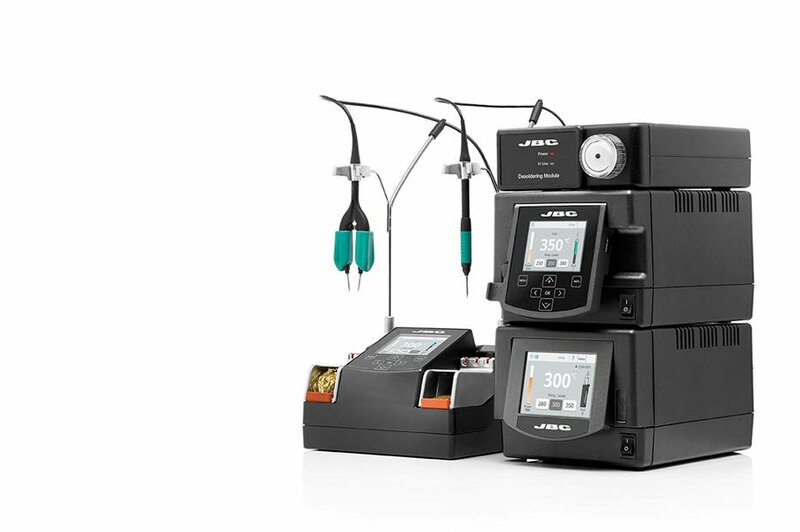 Why is it possible to solder at lower temperatures using a JBC tool? Which is the best system to clean the tips? It depends on maintenance issues and on the technology of the soldering system. A wet sponge is an efficient system if it is kept clean and damp (not swamped), it is changed periodically and deionised water is used. The tip’s temperature partially decreases during the contact with the wet sponge, but this could be a disadvantage only with older generations of soldering systems, where the iron does not have a very fast thermal response and it takes several seconds to recover the working temperature. The cleaning wire (brass) is an alternative to the sponge. It needs less maintenance and does not decrease the temperature of the tip, that’s why some handsoldering producers with low thermal response prefer it. On the other hand, it releases some material residues which may fall on the PCBs if the holder is not protected. The stand of the brass should be heavy in order not to move during its use, otherwise the operator will need also the other hand to hold it. The metal brush is a more aggressive way to clean the tip, but if used gently cleans well the tip with minimal damage. The tip tinner / cleaner is a chemical method to clean and retin the tip at the same time. It should be used when above methods fail and a very active cleaning method is needed. There is also a new sand cleaning method from JBC: the tip must be entered inside a protected sand deposit and turned it around. This method is advisable when all else fails. What’s the most recommended type of wool? Brass wool: Although less aggressive than the Inox Wool, it is easily subject to breaking down. This can cause metal particles and fibers to contaminate the enviroment of the working area. We have a very large and experienced customer that refuse the use of Brass Wool technique for this reason. Brass wool was first used in the industry many years ago and, as sometimes happens, it became an industry standard and adopted by many vendors. Inox Wool: It is more agressive than the Brass wool and may require more restraint from the operator when using. This method proves to be the most effective when the user applies less aggressiveness and minimizes the abrasions – Less Is Better. Apart from being more effective with controlled use, Inox is much more durable than Brass. It is more flexible, less fragile, and as a result, reduces broken particles and contamination. In our testing we found it very resistant to breakage and less than 10X broken particles were found than with Brass wool. You can change this password for another one. If you enter 3 times an incorrect code, the station will give you an 8 digits number. Please contact us with that number and we will help you out. 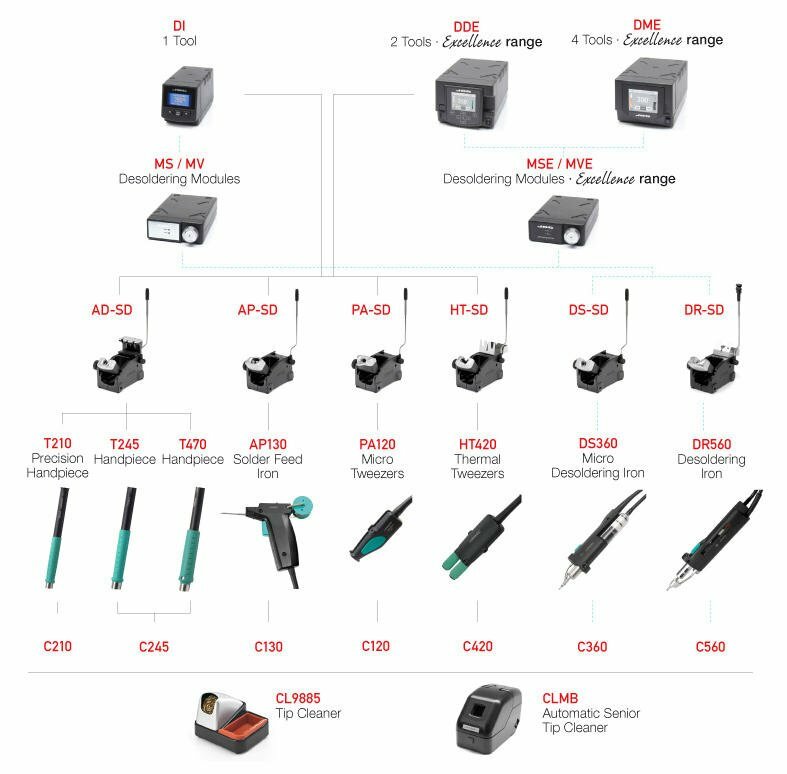 Our equipment is being used by government contractors, high reliability OEM’s and CM’s and many other manufacturers who take the time to evaluate everything about their soldering process, from the cost of ownership to safety,to ergonomics to the thermal performance on every joint. JBC Tools use one wire buried deep in the tip of the copper to “read and feed.” Their thermocouple and heating element wire are one in the same and are microprocessor driven over a sensor at 60 hertz utilizing up to 140 watts on demand in a very low mass cartridge. This is why their thermal performance cannot be matched. It is technolgy compatible with todays needs, as well as tomorrows. Our competitors are using technolgy invented 20+ years ago with little advancement. How long is the warranty on the JBC Soldering Equipment? Our JBC Equipment has a 2 years warranty which guarantees the equipment against all manufacturing defects, covering the replacement of defective parts and all necessary labour. Warranty does not cover product wear due to use or mis-use. In order for the warranty to be valid, equipment must be returned to Kaisertech and enclosed a note of the problems that have been found.